OUR BIGGEST EVER ISSUE WITH OVER 140 CRAFT PAPERS!! Spring has most definitely sprung! The birds are cheeping with excitement and flowers are starting to blossom! Everything feels a little better when the sun shines doesn’t it! 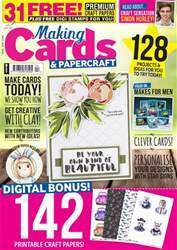 Within this edition we pay a particular focus on making cards for men and boys. We know these cards are often tricky to make, whether through difficulty deciding on a theme or the struggle of getting your hands on the relevant stash. Hopefully we go someway to helping with your bumper stash of craft papers and the many great ideas from our wonderful contributors! 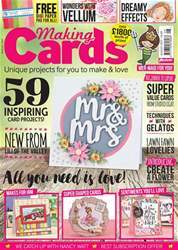 If you have time to pop your feet up with a cuppa for five mins turn to page 60 to read about what husbands and partners think about your papercrafting hobby! It’s an interesting read! We also chat to YouTube sensation Simon Hurley to get perspective on what crafting means to him!